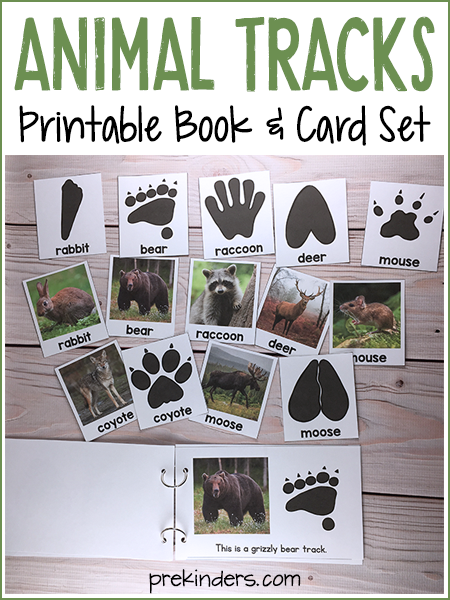 Here is a printable Animal Tracks Book and set of Matching Cards that will be perfect in your Science Center during a Forest Animals theme in the Fall. This was created with Preschool, Pre-K, and Kindergarten kids in mind. 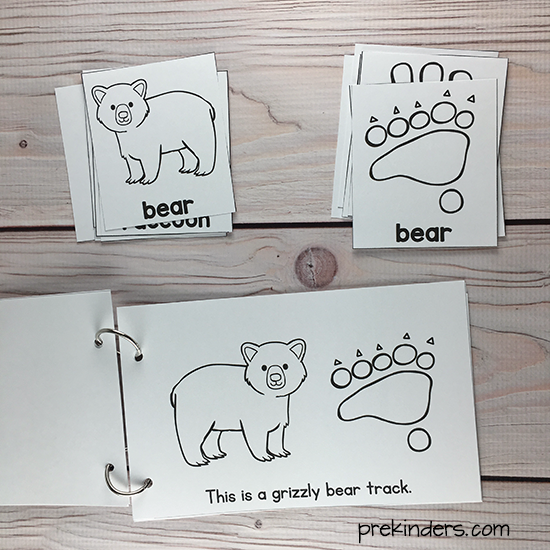 Children will use this emergent reader book to learn about the animal tracks of different forest animals, and then use the card set to match the animal tracks to the animal. There is a printable book and card set in full color with real photos of the animals. I also made a blackline set for those teachers who need to save ink. I set this up in my Science Center with both the book and cards in a basket. If children need help matching the animals to their tracks, they can use the book as a reference. Print out the book and cut each page in half on the gray line. To make it more durable, print on card stock paper and laminate. 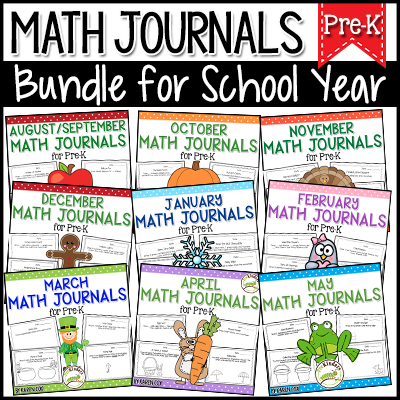 You can bind these books with a stapler, binding machine, or with metal or plastic rings. Print the card set and cut out on the lines. 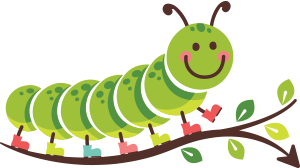 The following links are free resources here at PreKinders. Forest Animals Theme Unit: Find tons of Forest Animal activities for Pre-K, Preschool, and Kindergarten — this theme is great for Fall! Squirrel Play Dough Mats: Use these printable mats to practice counting while using with fine motor muscles! Books about Forest Animals for Kids: Lots of books for this theme with activities to go with them. 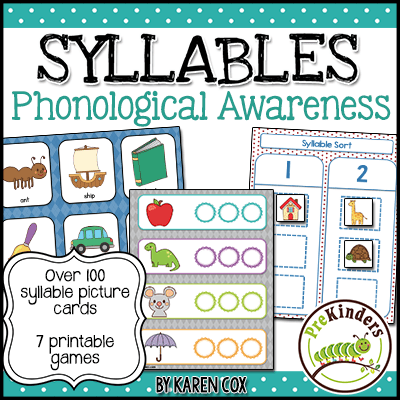 Forest Animal Picture-Word Cards: Free printable picture-word cards for learning vocabulary and to place in your Writing Center. Thanks, Nicole! I mainly wanted to add some books to my science center, so it’s mainly for them to look at. I am also adding a set of the Animal Tracks cards & they can match the animal to the tracks & use the book to find the answers if they need it. I love this idea. I printed a bunch of different animal tracks and put them around the hallway at school. I told the students that animals were in the school last night but I didn’t know what kind of animal. I gave each student a magnifying glass and we went on an adventure to walk around the school looking for tracks. Each set of tracks ended at a paper bag. After the students guess which animal made the tracks, I pull a picture of the animal out of the bag. They absolutely love it!!! I love that idea, Casey! I’ll have to try it. Thanks for sharing! This is way nice than the one I made. Just wondering though what is/are chicken rings ? I’ve had the chicken rings for years. They came from the Center for Innovation in Education (Math Their Way). I don’t know if they still have them, but you could look on their site and see. This is a great book for the little ones! I have done the animal tracks matching activity with my Native American unit for many years. Once I even set it out on the pocket chart for Open House and had the children match wits with their parents to see who could match the animal tracks to the animals best! The children, having been coached through it ahead time, really beat the pants off of their parents, LOL! It was pretty funny! Thanks for the great activity! For some reason in the pdf the pictures are overlapping. Help please! Thanks Karen for sharing this book of yours. It will surely be one of the most resourceful aid for teaching and learning; most of these animals are not familiar to my little one’s as we live on a small island and this will boost their curiosity. and It only prints the first page. I would love to add this to my lesson plans! Thank you so much for all the wonderful resources you put on here, I use them often. Thank you so much for this activity!! I teach kindergarten and elementary ELLs, and this month we are reading “We’re Going on a Bear Hunt”! The animal tracks activity is an excellent extension for my students! Thank you for this activity! I was looking for animal tracks as we were talking about the forest and the animals that live there. We plan on going on a scavenger hunt with a flashlight after reading the book Flashlight by Lizi Boyd. This is perfect! Thank you!